Libya remains a dysfunctional state largely due to failed American policy. 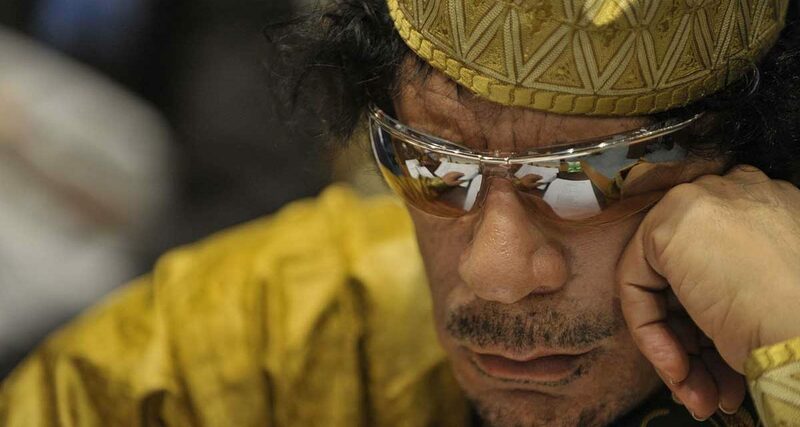 The 2011 Obama/Clinton support to Al Qaida affiliated groups in order to oust Muammar Gaddafi heavily backfired, with ISIS now profiting from the massive wave of immigration, which also destabilizes Europe. President Trump has a unique chance to fix this terrible mess by backing the appointment of the leader of the Libyan national reconciliation, Saif al-Islam Gaddafi, as head of state, the only man able to reunite the tribal nightmare in Libya, and to form a proper democracy, exterminate ISIS, and solve the immigrant crisis. Millions marched in Libya July 1st, 2011 in support of the government of Muammar Gaddafi, and pleaded for NATO to stop the destruction of the country. At that time, the massive support for Gaddafi was not reported in the mainstream media, yet it was well known that Gaddafi had many supporters. Libya was Africa’s richest country, a socialist, welfare state with lavish benefits, free education, and good living standards. Since 2003, Libya had opened up towards the West in a liberalization process largely led by Saif al-Islam Gaddafi, who was instrumental in resolving the Lockerbie-bombing issue and paying damages to the victim’s families, deescalated the military, removing its nuclear arms and privatized the economy. It was Saif al-Islam who freed the Bulgarian nurses in Benghazi, led the large scale Benghazi housing projects, created the Charity Gaddafi Association which helped poor countries in Africa, as well as worked diligently to democratize Libya. He called for a free press and hoped to issue a Constitution of the state. It was also Saif al-Islam who led the Reconciliation Project in 2006 between the government and the opposition, and the peaceful release of political prisoners, like Abdelhakim Belhadj and Khaled Sharef, most of whom joined the rebels and are controlling Tripoli now. Libya was, prior to 2011, closely cooperating with the CIA and Western intelligence in order to eradicate the Sunni terrorist groups in the region. Gaddafi was an enemy of Al Qaida, which had tried to kill him several times. Under this cooperation, the US and Libya created stability in the region and controlled the immigration flow towards Europe. Yet, by 2011, mainstream US news outlets and partisan NGOs were responsible for massively presenting misleading information that later turned out to be wrong, which served as a pretext for NATO’s support for armed rebels to overthrow the Libyan government. The basis was that Gaddafi “bombed his own people” in what was described as “a genocide”. But already in early March, US secretary of Defense Robert Gates said that no such attacks could be confirmed. The Russian military monitoring the situation via satellite said that no planes had been in the air at the time in question. In the hands of the very few, any war may easily be ignited by using mainstream propaganda tools. As we know, 90% of the American media is owned by 6 corporations and only 62 individuals now own more than 50% of world assets. US foreign secretary John Kerry further enlightened us in his leaked conversation with Syrian oppositional groups, first published by The Last Refuge January 1, 2017. The secret conversation took place September 22, 2016 and in it Kerry states that the US was heavily arming rebels in Syria and watching ISIS grow and that the reason for the intervention of Russia, which the US heavily opposed, was that “Daesh [ISIS] was threatening the possibility of going to Damascus”. He also states that the American goal is to remove the Assad government in Damascus—the same goal as Daesh—and that the Obama administration was hoping for ISIS to strengthen its position in Syria. Assad was “threatened” by ISIS, he says in the recording, and the administration thought it “could probably manage” the situation to force Assad to negotiate; but instead, Russia intervened to support Assad against the extremist group. Thanks to Wikileaks, we also know that the authorization for the Libya war was Hillary Clinton’s achievement, which meant turning the state into an ISIS haven. Her notorious laughter when hearing about Gaddafi’s brutal death makes one realize what kind of ruthless gang of bandits that the US had as political leaders, people with no respect whatsoever for national sovereignty or international law. This American cartel activity is now out in the open to the point that president Donald Trump openly states that Obama is the founder of ISIS, co-founded by Hillary Clinton. Which, by the way must be a great joy to many Muslims, who for years have had their religion thrown in the dirt since “Islam is barbarism, just watch ISIS”. As it turns out, ISIS is American geopolitical barbarism at its worst. Der Spiegel reporting on the finding of the ISIS organization chart, discovered in the house of killed ISIS strategist Hadj Bakr in 2015, further showed that ISIS was not particularly occupied with Islam, but rather much more about intelligence, surveillance, and military operations, and how to infiltrate and break down Syrian civil society. The chart shows remarkable resemblance to CIA organizational charts of covert operations, hardly easy for some rugged Sunni-Baathist remnants in northern Iraq to chart out. Current ISIS leader in Libya Abdulhakim Belhadj, who was a leading NATO ally in 2011 and became the military governor of Tripoli after the war, long displayed his excellent relationship to republicans such as John McCain. The senator must be an exceptionally stupid individual, hailing on his own webpage Belhadj as a “Libyan patriot whom we should support.” He further notoriously asserted that it was he and Lindsey Graham who convinced the Saudis to fund the opposition in Syria—thus proudly stating that it was the US who got the Saudis into the whole Syrian mess. Furthermore, the shocking scandal on how the Obama/Clinton-backed government in Libya have detained thousands of prisoners for years and kept them without trial in Libyan jails, is currently, maybe, the world’s worst example of lack of respect for the Geneva convention and the standards of international law for the humanitarian treatment in war. Human Rights Watch has long complained about this. Sources on the ground state that as many as 35,000 Gaddafi loyalists have been incarcerated and continually detained without trial since 2011. This is happening in Tripoli, Misrata, and other places in Libya under the Western backed leadership and under Obama/Clinton’s watch. The Libyan Islamic Fighting Group and its ISIS leader, Belhadj—the great friend of senator John McCain—is, according to Libyan sources, currently controlling these prisons, there among the Hadba Prison in central Tripoli, where Libyan leaders and Al-Saadi Gaddafi have been kept since 2014. Al-Saadi is currently very ill and urgently needs proper medical attention or he will probably die. In the aftermath of the Arabic network Clear News’ 2015 release of the documented torture of Al-Saadi Gaddafi under the Western backed government, nothing much has been done. It was a shocking video that raised serious questions about the treatment of prisoners. It is now reported from Tripoli that around 7,000 of the 35,000 thousand detainees are women, many being as old as 80 years of age. They have been in these prisons for six years. UN Human Rights groups, now active in Libya in order to try to solve this situation, are of course fully aware of the utter disgrace this is to Western powers, who helped instigate the Libyan tragedy. Sources on the ground state that ISIS’s support is now faltering in Libya as the movement has little local support—allegedly always, by the way, paying its bills in euros or US dollars. Saif al-Islam now has united the tribes and strategically positioned his allies all over the country. A final point. Libya was extremely rich before 2011, on the verge of implementing the gold dinar and working toward implementing broad African unity under this currency. At that time, the Libyan Investment Authority (LIA), constituted in 2006, had over $150 billion in assets invested world-wide. The financial accounts from 2010 display a full overview of detailed accounts and contents of its LAFICO, LAP, OIL Invest, LTP and LLIDF branches. In the vault of the Libyan Central Bank alone lay 144 ton of gold. What the mainstream US media spoke of in 2011 as Gaddafi’s “personal wealth” turned out in large part to be the Libyan Investment Funds and contents of the Libyan Central Bank, public institutions to which Gaddafi had no direct access. This was reportedly again stated on December 12, 2016, to the Official Libyan Channel by the vice chairman of the Presidential Council in Libya, Ahmad Maiteeq. He was addressing the issue of the $67 billion or more US dollar investments currently available outside Libya, the ban on the Libyan Central Bank now having been lifted—the question, of course, again being the dire necessity to control who withdraws what, in order to ensure that the Libyan funds are not continually disappearing into various personal accounts, as has been a vast problem since 2011. So, ever since ex-president Obama managed to “shed a tear” and call the Libya war the worst mistake of his presidency, we are still waiting to see action and the US and associates to release back to responsible rulers in Libya its billions in assets. If you regret stealing, bombing, and destroying people’s lives, you should also return the money and pay damages. The national Libyan assets never belonged to the US Obama/Clinton administration or its affiliated international cartel friends. Yet, according to sources on the ground, the US still control part of the LIA, Libyan Central Bank, and oil revenues through its liaisons with the Western backed Tripoli government, where the current Central Bank governor, Sadiq al-Kabir, the link to IMF and other Western institutions. The LIA currently consists of $67 billion investments, yet in 2011 its frozen assets were around $150 billion. Many wonder what happened to the discrepancy and hope to establish in the future who took what. President Trump has a golden moment in history to breach some of the terrible reputation the US now have all over the globe, as US war-mongering and ruthless foreign policy has caused unspeakable damage to millions of innocent civilians, traumatized by loss and bitterness, outside the US’s own borders. It is obvious that the Trump administration aims to team up with more moderate forces in the Middle East. When Gaddafi was in the US, it was Trump property he placed his tent on. Repeatedly Trump admits that “getting rid of” Gaddafi was a big mistake, stating that Libya would be a 100 % better country if Gaddafi had not been killed, Sources now state that more than one million Gaddafi supporters live in Egypt, waiting to return to Libya, and around 300,000 in Tunisia. Peace in Libya would for certain award the US President a great name as a peace broker in history. The solution to the Libyan crisis is to support the Green movement and The Popular Front for the Liberation of Libya, now nationally unified behind London School of Economics-educated Saif al-Islam Gaddafi. The push is for equality, prosperity and stability, away from division, exclusion and marginalization—the reunification of the Libyan people under one democratic, tribal-backed leader. The development will be most interesting to follow in the months to come.